Tree climbing—a long and honorable tradition for us primates. Ever watch a chimp eat a banana with its foot? Primates are optimized for climbing because they have grasping hands and feet. Anthropologists call it facultative arboreality. It's why a chimp's hands and feet look more similar to each other than ours do. When some of us primates switched over to walking and running, our hands and feet diverged in appearance and function. They were no longer quite so interchangeable. Christy Brown was a famous Irish painter who earned accolades because he painted with his left foot. (What's-his-name starred in that movie). His cerebral palsy rendered all but his left toes capable of holding anything. He had to reawaken his ability to grasp with his foot in order to create his art. The rest of us have the luxury of letting our fingers do what they do best. 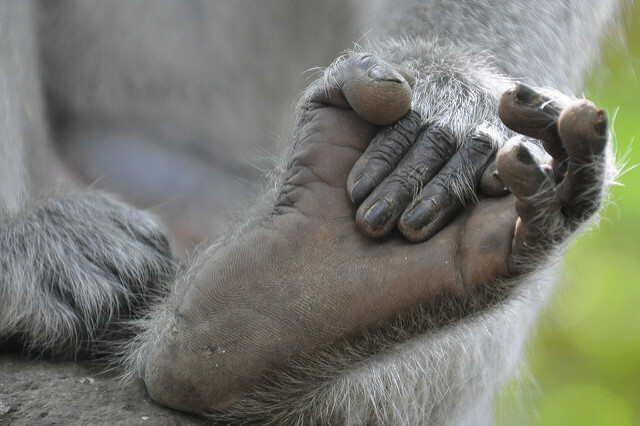 Here is a stock photo of your average monkey foot. You can see for yourself what I just said. It looks like a foot, but it also looks like a hand. I teach adult beginners to balance themselves with their weight equally distributed on the entire soles of both feet. That means they should have the same feeling on the balls of their feet as well as their heels, and the same amount on the left and right side of their feet. Because we can't grasp a darn thing with our feet while they are locked into our boots, we can only leverage our balance by making maximum use of the small amount of acreage down there. As a beginner, your weight should be equally distributed over the three dots (Please I beg you not to make fun of my artwork). When a beginner twists their feet left or right in order to turn, they are now using as much of their soles to help them accomplish their first turns. Same thing is true when they stop. They can generate a more effective stopping force by engaging as much of their soles as possible. As we climb the tree of skiing expertise, however, we need to develop the ability to ski on the appropriate parts of our feet at the appropriate times. In powder, we need neutral feet as explained above, at least until we get the feel of the powder. Then we can roll onto the balls of your feet when needed. On groomed, we alternate between the balls of our feet and our arches. Arches at the end of the turn; balls of our feet to help us swoop or power into the turn. In bumps, we want to be as agile as possible. So up on the balls of our feet and stay there, especially if you are ripping the fall line. In a left turn, our big toe on our right foot and our little toe on our left foot tip in unison into the hill. A lot if you are carving, not so much if you are sliding through the turn.You may have heard people tell you to roll your ankles into the hill. This is really what they mean. You don't ski on your ankles, you ski on your feet. During a right turn, our big toe on our left foot and our little toe on our right foot are partnered through the turn. FYI, if you refer back to the October issue of SKI NEWS, you'll see Tom's advice about pausing between turns. When you pause, you level out your feet for a split second then dip them in the new direction. I hope this was fun to read. And I hope you got something out of it. Now, go eat a banana . . .